Fall is finally here. Cool evenings, hot and muggy days, lol. 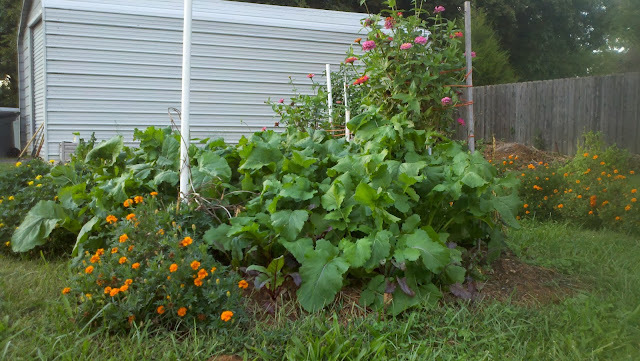 The summer crops are winding down, and the fall plantings are starting to kick in. The blackberries took off, even have some suckers coming up already. May have to move them back into the shade. I don't need that many blackberries. May put some muscadines here instead. The raspberries in the back are also going well. Got a few reds this year, and am looking forward to the buckets of gold raspberries next year. The blueberries didn't do so hot. 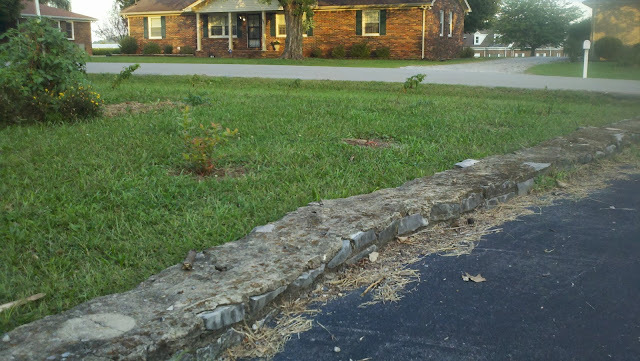 I planted the first bundle I came across in my spring fever daze; definitely better to do your research first. All three varieties were northern high bush which will grow here in middle Tennessee, but have to be pampered through the summer. 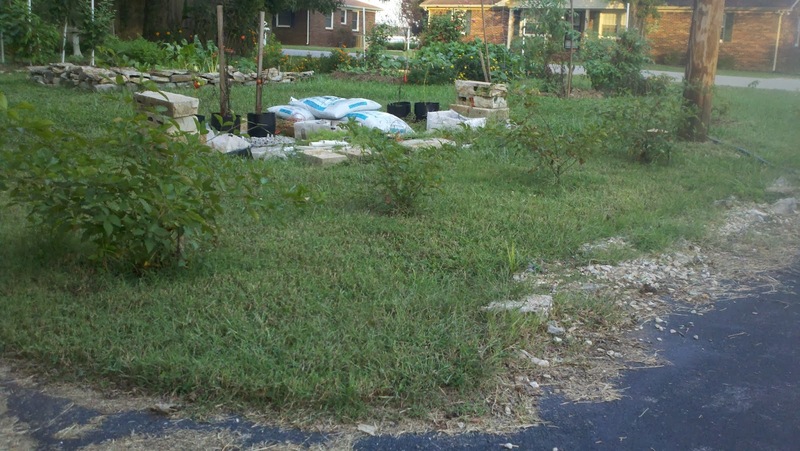 There are a few southern highbush and some rabbiteye blueberry bushes I'm looking at to replace the two that didn't make it. 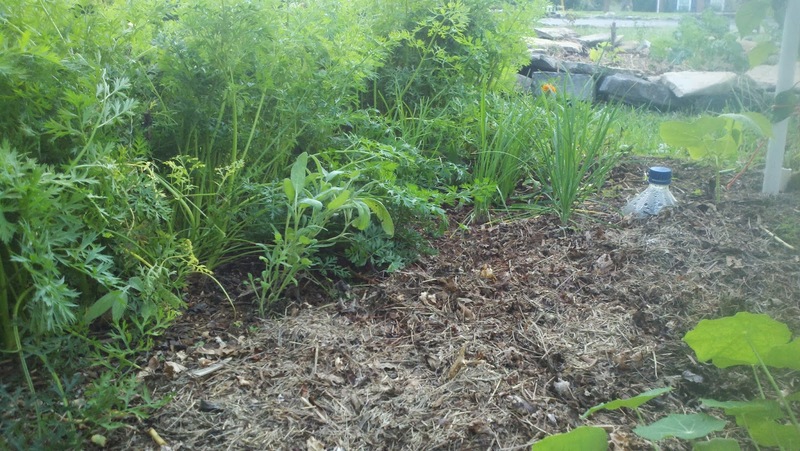 The carrots are ready for harvest, or long storage in the garden until I need them this winter. First year sage and chives are also doing well. A surprising harvest of 2-liter soda bottles can be seen springing up on the right... Pepsi variety. Lol, just kidding. I've been burying 2-liter bottles with holes punched through the bottom in the beds. I can pop the top and drip water into them, saturating deep underground instead of just wetting the top layer of soil. The peppers are loving their new, sunnier spot. Instead of a measly 4 hours of sun, they now get 10-12 and a plethora of tasty (if late in the season) peppers have finally arrived. I managed to save some peas from the spring harvest and they're growing quite well in the front here. I'll have to trellis them this weekend. 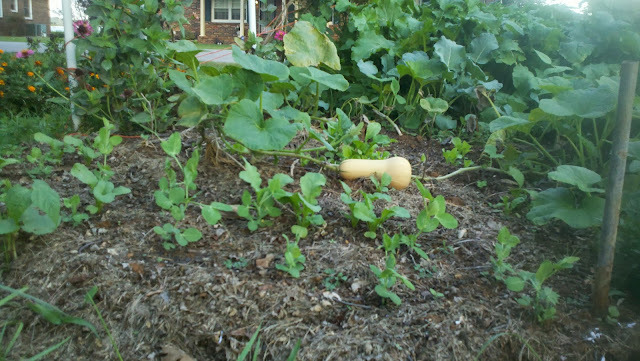 Butternut squash, some buttercrunch lettuce (hmm seeing a theme here), and some butter-broccoli (no, not really, just standard broccoli) are tucked in behind. The turnips have done better than I could have hoped. Huge, thick greens. Even a half-dozen of fist sized purple turnip! They made some great turnip hash browns for breakfast and a creamy turnip and ham soup for supper. The fall greens are coming along nicely in the first bed. 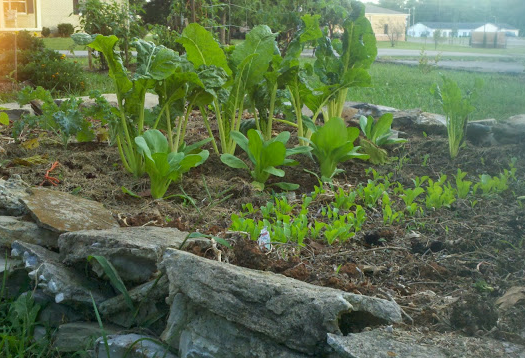 Some baby romaine in the front, bok choy swiss chard, and kale behind that. I've found that swiss chard is a lot more to my liking if I boil the leaves in salt and lemon juice for 2 minutes. Then I used them just like spinach, with even better results. I had been having a terrible time with slugs earlier in the year. They don't really care about the BT treatments. I found that cutting some water bottles in half, sinking them into the ground, and then filling them with beer (the maltier the better) makes a terrific slug trap. Their annoying presence has dropped significantly since I started using the traps. So you have this beautiful Swiss Chard. It might be green, red, yellow. But what do you do with it? I just tastes so bitter! I've found that if I remove the stem, rough chop the leaves, and then boil in salt water for 2 minutes that bitter taste goes away. And unlike spinach, boiled Swiss Chard maintains a delicious, slightly crunchy texture, not slimy at all. It's then perfectly suited to saute with bacon and eggs, add to a casserole, just about anything (except maybe a salad). 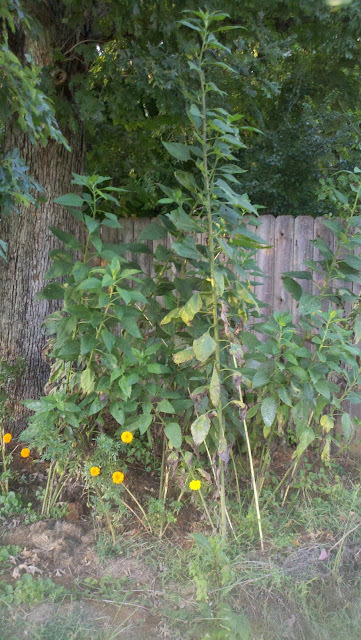 The Jerusalem Artichokes continue to amaze me. Here they are, a good 12' tall, and they're in the shade of a giant oak tree, with maybe 4 hours of sun a day! They've not flowered, but goodness are they growing! And the final surprise, if a little (a lot really) disturbing. Tomato hornworms. Now I hate these things. They exist solely to eat holes in my most perfect tomatoes. I've been sorely tempted to resort to pesticides to kill these little buggers. I had almost decapitated this guy (especially because of all the eggs on it's back), when I remembered something about this being a good thing from some podcast ages ago. 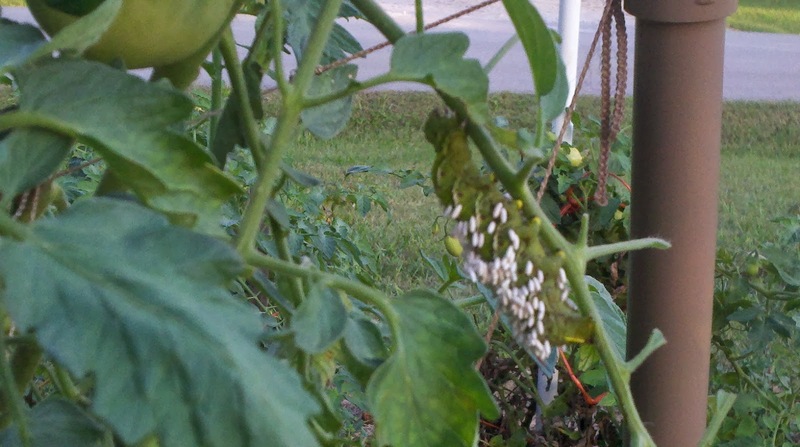 Did some digging, and these eggs belong to the Braconidae family of wasps that prey on the tomato hornworm. Yes the hornworm is alive, and yes the larvae are actively feeding on him. 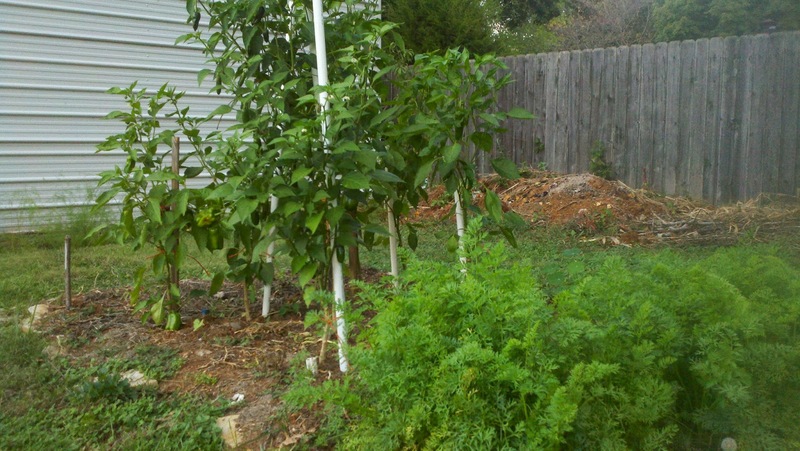 I almost feel bad for the nasty little worm... but then I remember my poor tomatoes and the feeling quickly subsides. Being a nursery for wasps wasn't really appealing though, until I read that these are tiny (1/2" long) and they kill more than just hornworms. After reading this list I do believe my garden is in for a great shift next year as the beneficial insects move in. They kill: caterpillars, beetles, aphids, squash bugs, and stink bugs! Pardon me as I enjoy an evil chuckle; muhahahahah!